Desi indigenous food lures me like nothing else. 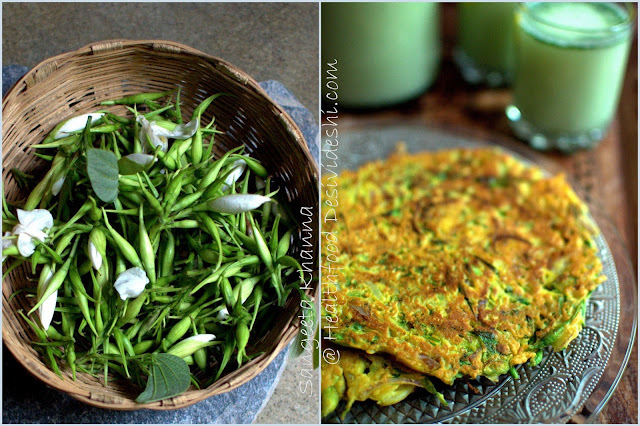 I am someone who would keep looking for weeds in the garden and pluck and wash some wild purslane to make a quick omelet with it or a besan ka cheela with wild purslane (noni ka saag). The real riches from the mother Earth, just beneath our feet are untapped. We need to revive them, celebrate them and use them for getting the best nutrients. All the naturally growing Drumstick trees, Goolar (wild Indian fig) trees, mulberry trees and Jamun trees in my vicinity provide a rich supply of tremendously nutritious, organic food all round the year but no one seems to care about them. It's a blessing to be picking the fruits from under the tree, rinsing them and preserving them to make yummy jams. I wonder why people are choosing processed packaged foodstuff in a country like India where you get cooks and maids so easily who can take care of the daily chores and provide one with good home cooked nutritious meals. I think everything instant is replacing the slow cooked, chemical flavors are hijacking the taste buds and food industry is inundating people with false notions about nutrition as well. After all a nutrient stripped fruit juice which is coloured and flavored chemically and then fortified with chemically synthesized nutrients is now considered a must have at the breakfast table and our local amrood and ber is sidelined. Blame it to the marketing and advertising, packaged is deemed better than real. Painful reality. That is the reason I wanted to have a copy of this wonderfully curated book First Food, a taste of India's biodiversity, edited by Sunita Narain while the concept and research is by Vibha Varshney. 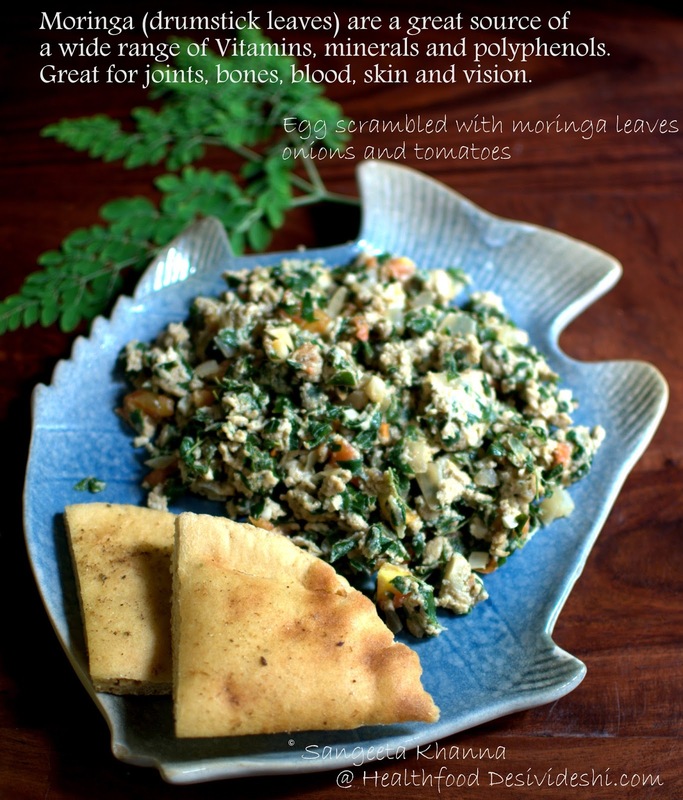 The book is about all the traditional foods from Mahua to Makhana, karonda, chaulai in the form of greens as well in the form of grains, hemp seeds and drumstick leaves. A subject very close to my heart. For your information, drumstick leaves can be used everyday for egg scrambles (recipe here) and curries. See how drumstick leaves have immense nutritional potential. Real nourishing food is easy and fast as well. See it yourself. I attended the book launch that happened amid much fanfare, a very welcome step as more and more people need to appreciate real food from our land. The food that grows in our jungles, in the water bodies by the villages, in the dry arid areas where nothing else can grow and in our own neighborhood, be it in the form of roadside trees like mulberry, jamun , tamarind or Bauhinia (kachnar) or the common garden weeds alike amaranth, wild purslane, oxalis, punarnava (Boerhavia diffusa) or bhumiamlaki (Phyllanthus niruri), has much value not only in nutritional terms, but supplementing and conserving biodiversity of our remaining breathing land. 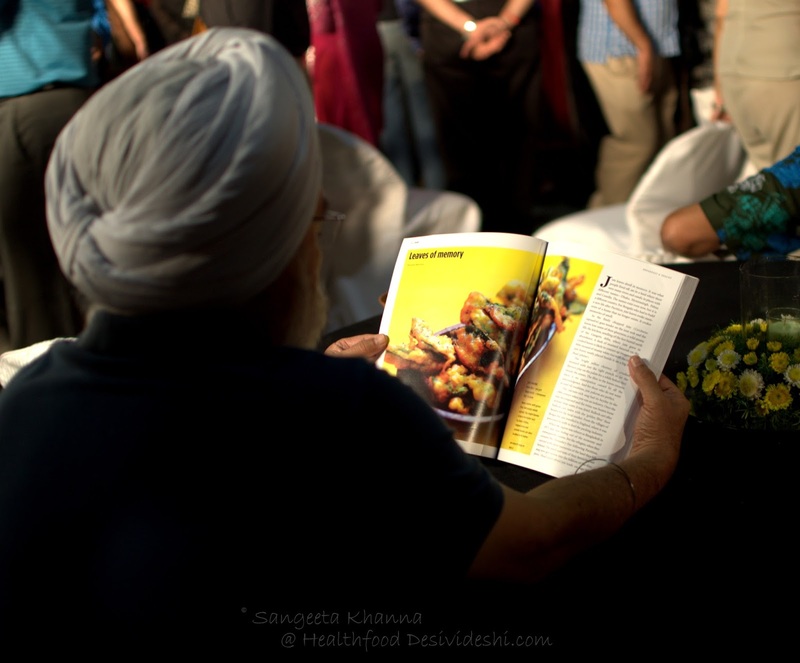 The book launch was held at India Habitat center, in association with Indian Accent and Chef Manish Mehrotra created magic with all these desi ingredients. We enjoyed ramdane ke laddu, bajre ki khichdi, sattu ka paratha and many more desi foods. Gahat ki daal (horse gram) gets a new lease when Chef Manish Mehrotra cooks it from the book. 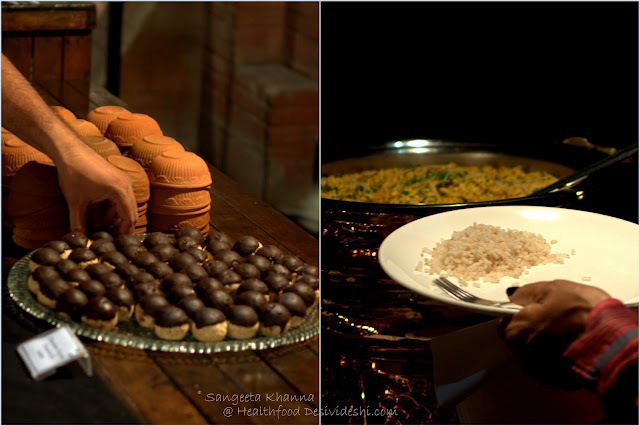 See the ramdane (chaulai/amaranth) ke laddu dipped in chocolate and some rice with gahat ki daal being enjoyed by all. The riches of the poor as Dr. Pushpesh Pant rightly quoted at the book launch, the book is a pleasant collection of all things desi. Absolutely my kind of book. 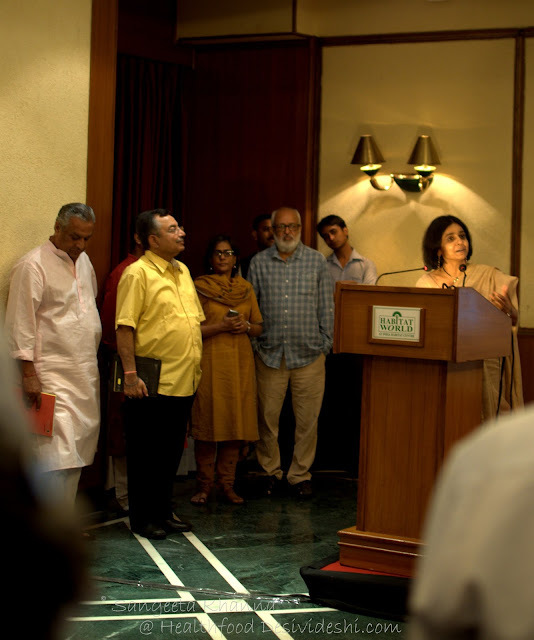 Here is Sunita Narain speaking at the book launch and Dr. Pushpesh Pant, Vinod Dua and Vibha Varshney looking on. The book generates curiosity instantly. 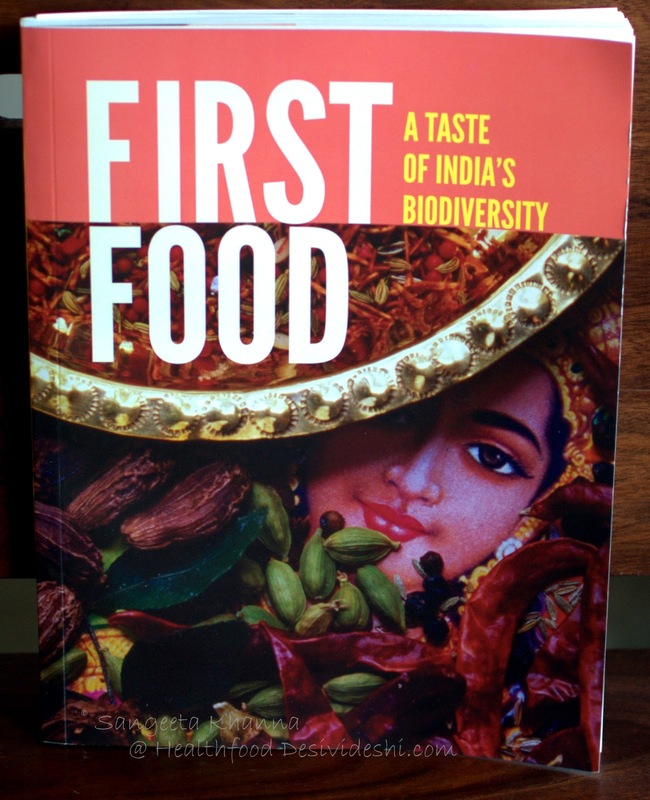 This book will be a reference point for many of us who want to know more about regional foods..
Food is not only about feeding the populations and nutrition, it is also about sustainable growth, preserving the ecosystem and supporting the small time farmer whose makhana and singhada would be in demand and the poor man who just collects mahua flowers from the jungle and makes a living out of it. Trust me you would find ways to get some sun dried mahua flowers once you have tasted how a malpua sweetened with it tastes like. I am reminded of my grandmother who used to procure it from her sources as we could taste those things because of her. She made us savour Sanai ke phool, Sanai ke patte (jute flowers and leaves) as well as Goolar ki subzi (wild fig curry). A kachnaar ki kali ki subzi or cheela was a favorite. First Food talks about all these foods and more. Food from Himachal and Uttarakhand hills, from southern states, fermented soybeans and khuri (buckwheat pancake) from the north east are introduced to an urban reader and the concept of food safety is discussed. Although I wish Food safety was given a little more mileage, would have been more useful for someone who wants to procure dehati (rural) foods and cook with them. There are numerous recipes from Bael ka sherbat to Kali gajar ki kanji, Karonde ki chutney, pitha in turmeric leaves, til ke laddu, singhade ki katli, makhane ki kheer, etc etc. You see I have written in detail about such foods over and over again. Here is a rich kheer with makhana and curry and raita with makhana is common at our place. I wish this book had some more such foods from our faraway lands, sitting in a metro city really disconnects most of us from the roots and that looks like a faraway land. I have a few concerns about the recipes in First Food. Many recipes are not well explained and someone who has never handled those ingredients will be lost. Like Amaranth (chaulai) laddu is an exhaustive recipe just because you need to know how to pop amaranth seeds. The recipe doesn't throw light on how to pop amaranth seeds, it just says 'roast chaulai lightly'. Which is misleading. Also vegetable oil is used in many recipes while all traditional regional recipes are normally cooked in mustard, sesame, coconut oil etc etc. Vegetable oil is crap (a larger concern after a flood of pomace, canola and rice bran oils in Indian markets) and the book should have talked a little about cooking oils as well. I missed that in the book. I also felt the pictures could have been better for a book that is printed on good quality paper and is priced premium. 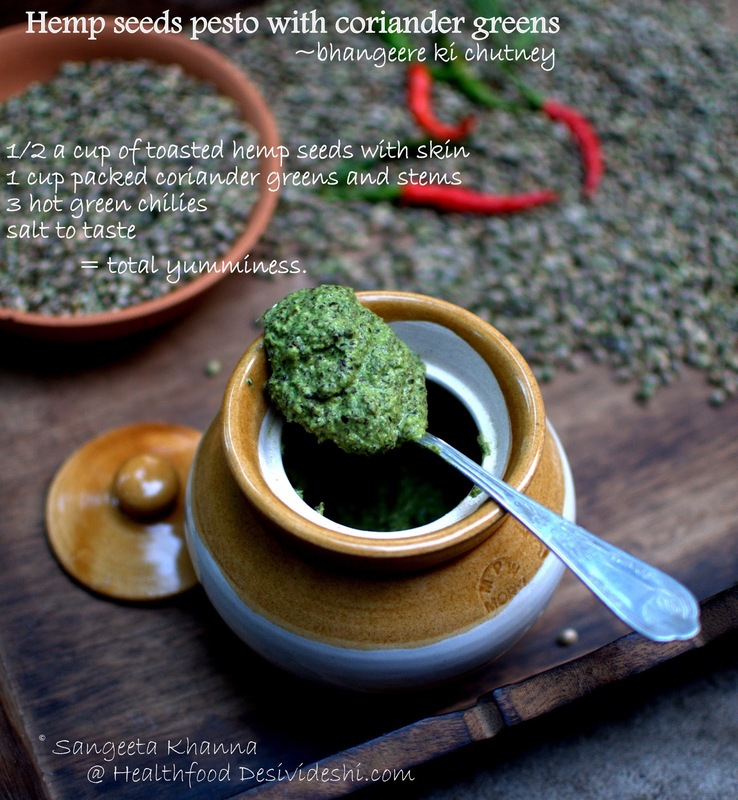 I had made a bhang ki chutney (hemp seeds and coriander greens pesto) some time ago and it was waiting to be shared here. What would have been a better occasion than unveiling a book like First Food, the chutney is here with all it's nutty aroma. I always pick up my hemp seeds from Trade fair and the Krishi mela held at IARI and the recipe is by those stall owners who sell hemp seeds. I shall try the recipe from First Food soon as it has some fresh apricots added. 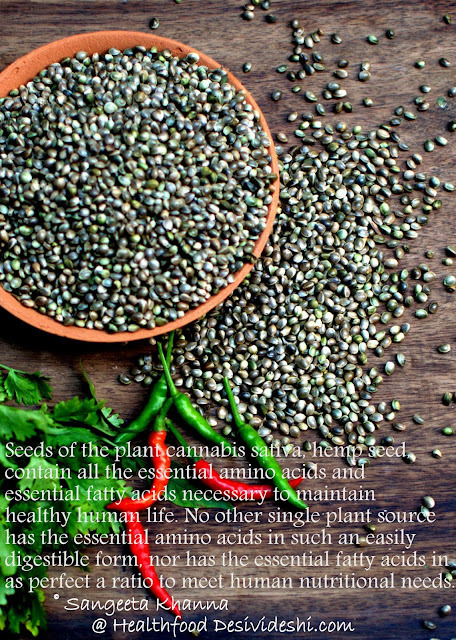 Hemp seeds are a desi super food. A complete range of nutrients makes it the ideal food for the common man. Thank God it is still available freely in the hills of Uttarakhand. Finding great food value from neglected ingredients, not just for the frugality but for keeping those foods alive, is a mission I have taken up through my blogs. I find First Food very close to my heart that way. Waiting for more such books from Down to Earth (and CSE) and congratulating Vibha Varshney, Sunita Narain and team for such an excellent work. PS : The Hemp seeds chutney is called Bhang ki chutney as Mr. Deepak Dhyani has mentioned. Bhangeera or Bhangjeera is another oily seeds found in the hills that comes from a wild growing herb called Perilla frutescens. Your review is like wholesome nutritious food & the accompanying snaps are the garnish ! I must get my hands on this book!! lovely review Sangeeta! Makes one want to go and eat out your suggestions..!!! Beautifully covered event, and a wonderful book to own! It is so important to embrace our local food cultures and to enjoy the benefits of a slow-cooked meal not a fast, processed one. As more families enter the work market where time becomes critical, and urban centers continue to grow with people, we will continue to rely on fast packaged foods (sigh). I understand Velva. We need the food industry also to get sensitive, use whole foods rather than overly tasty foods that is addictive (thanks to HFCS and MSG and many more such chemical culprits)We would buy it when we get some local vegetables and fruits preserved in a healthy way. Sun dried, frozen and pickled may be? Thanks for the clarification, Deepak. 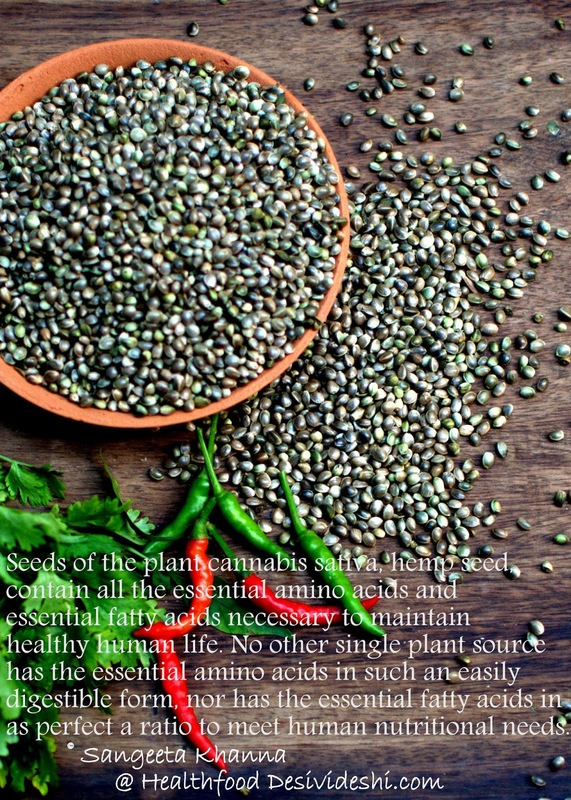 The photos shown in this post are of Bhang (Hemp) seeds, not Bhangjeera (Perilla). Welcome to the blog Deepak. And thanks for a comment. I have written Bhangeera and not Bnagjeera. Bhangeera is bhang seed as much I know, please correct if wrong again. Could you please share recipe of the mulberry preserve. Would love to know how u managed to make it with minimal sugar. Apologies for a delayed reply Taru. Mulberry preserve is made like any other fruit preserve, you just remover the stalks of mulberry and cook with sugar. 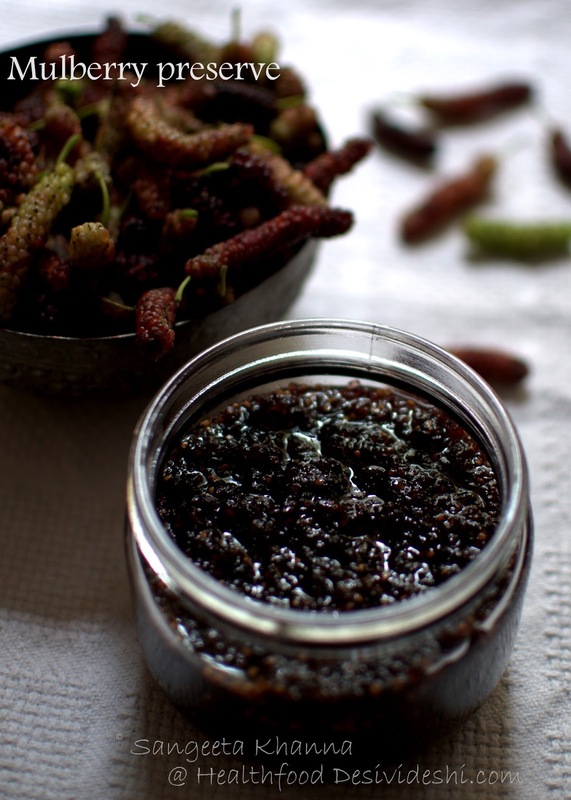 For about 500 gm mulberry you use about 100 gm sugar, macerate the berries first and then cook till the sugar dissolves and the preserve gets sticky and shiny, sprinkle water while cooking if required.. Bottle and refrigerate. 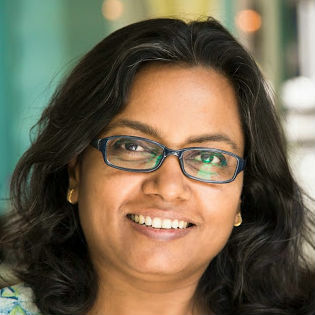 hi sangeeta, you've got a great blog. I particularly like the beautiful photos. I wanted to ask you a question about kachnar or bauhinia. I have a 3 year old white flowered kachnar tree in front of my house and I was wondering if the white variety is edible too. I know the pink one is but the white one is not very common in punjab. Your photo shows the flowers as whitish. Do you have any idea about the white flowers in cooking. I love your blog, particularly the beautiful photos. While going through your blog i noticed that the photo of the kachnar cheela on your blog shows white flowers. I have a 3 year old white kachnar tree in front of my house which has a lot of buds around this time of the yaer but i was not sure whether the white variety is edible or not. Do you have any experience or knowledge about the edibility of the white bauhinia? Yes we use the white flower variety of Bauhinia as well. I have a young tree too in my garden and I always use up all the buds and flowers.